The occurences of bed bugs have begun to increase after a decline in the middle of the 20th century. Bed bugs are generally reddish-brown, small, flat, wingless insects approximately 1/4-inch long. They feed on the blood of animals, which can include people and pets. Bed bugs are able to survive for up to 18 months without feeding. They hide in crevices on mattresses, furniture, along baseboards, and just about any other area that is protected. Bed bugs can attach themselves to luggage, clothing, and furniture and are spread when these items are moved. They will also quickly spread in buildings such as apartments and dormitories that have multiple units within close proximity. Bed bugs are not known to transmit disease to humans, but their bites can cause discomfort to those who are bitten. Common reactions to the bites are inflammation and swelling around the bite area and itching. Remove bedding materials and mattress and box springs. Wash bedding materials and dry at medium or high heat. Throw out items that cannot be thoroughly cleaned, treated, or inspected. 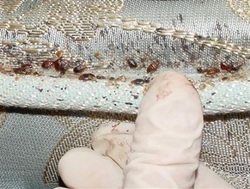 Contact a licensed pest management professional to identify and treat for bed bugs. The sight of a spider can put fear into many people. While spiders can be scary looking, some can be beneficial as they feed on other pests. The wolf spider is an example. 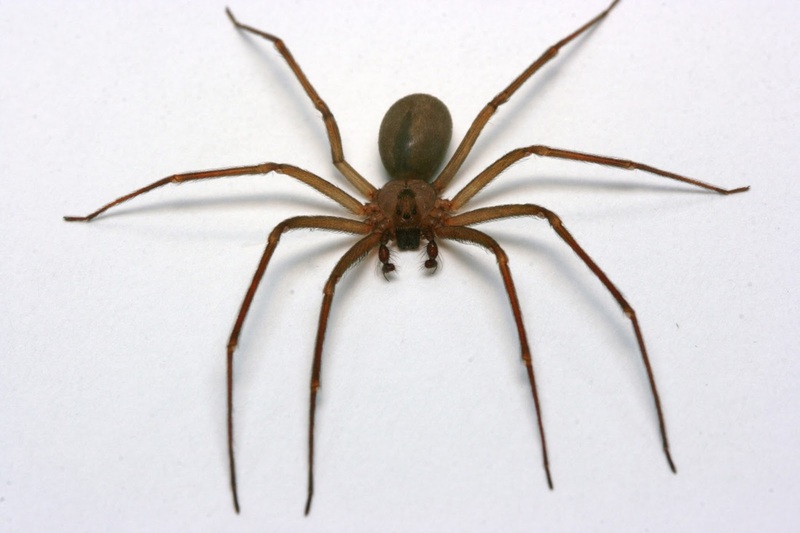 Some spiders, such as the brown recluse or black widow, can be potentially dangerous if they were to bite you. Spiders are typically not aggressive toward humans and will generally not bite unless defending itself. Effects from bites from a brown recluse or black widow are most often minor, however, more severe reactions could occur and require medical treatment. Knowing what to look for when you see a spider can help determine whether it is a more or less dangerous species and the types of contol measures that may be taken. The brown recluse spider has a light brown body, with a darker brown, violin-shaped mark on its back. It typically inhabits dark, undisturbed areas in buildings, such as in boxes, in walls and attics, and even clothing. The black widow spider is black and commonly has a brightly colored (usually red or orange) hourglass shape on its body. They are usually found in dark, undisturbed spots such as in crawl spaces, garages, or wood piles. Flies are a common nuisance for everyone, but people may not realize that these insects can also spread disease. Flies will commonly feed on garbage or another unsanitary surface and then fly to, and land on human food items, thus contaminating it. There are numerous types of flies that are commonly encountered. As with any type of pest control, inspection and identification of fly breeding sites is essential. Identifying and eliminating these areas is important to controlling the pests. Proper sanitation is another important step in attempting to control flies. Keeping areas clean that could potentially attract flies will also help to reduce numbers of these pests in your area. Methods of exclusion, such as window screens, are also important in control of flies. Fly traps and insecticides can also be used in conjunction with good sanitation and exclusion methods to control flies that have entered the building. Fleas are very small, but this pest is associated with one of the largest illness epidemics in history known as "The Black Plague." In the 14th century, fleas associated with rats spread a bacteria throughout Europe that killed millions of the European population. Epidemics have occurred in other areas of the world. Plague still occurs, but with antibiotics and early detection, its effects can be minimized. Cat and dog fleas do not carry human diseases, but they can carry tapeworms that infect dogs. Controlling fleas can be done by treating your pets with flea treatments and also by frequent cleaning of rugs, carpeting, and furniture. Proper pesticide applications can also be used. More information on fleas can be found on IDPH's Flea webpage. Cockroaches are common in many environments and are very adaptable. In addition to being a visual nuisance, cockroaches can also carry diseases. German cockroach - The German cockroach is the most common species of cockroach found in homes and other institutions in the U.S. Adults are pale to medium-brown in color with two dark stripes on the pronotum and are approximately 1/2 to 5/8 inch long. These insects hide in cracks and crevices and are generally most active at night. American cockroach -The American cockroach is sometimes refered to as the water bug. This species is large compared to other common cockroach species growing to 1 1/2 inches long or longer. The American cockroach is reddish-brown with a pale brown or yellow border on its pronotum. This species prefers dark moist areas. Oriental cockroach - The oriental cockroach is also known as the waterbug or black beetle. This is another fairly large cockroach growing to 1 to 1 1/4 inch long. They are dark brown or nearly black in color with a greasy sheen to the body. The oriental cockroach is commonly associated with decaying organic matter. They are also common in high moisture situations. Brown-banded cockroach - The brown-banded cockroach is approximately 1/2 inch long. It is light brown with two lighter bands running across its body. It is frequently found in the same buildings as German cockroaches. They are found on ceilings, high on walls, and on light fixtures to name a few areas. The brown-banded cockroach is not normally seen during the day. Smoky-brown cockroach - The smoky-brown cockroach is slightly more than 1 inch long and is a mahogany brown color. *Information on cockroaches obtained from Truman's Scientific Guide to Pest Control Operations.